Vegan Bacon Recipes - Cookbook Review of Baconish Vegans Eat What? Help support VegansEatWhat.com. Order this book via our Amazon.com link! If you love animals and the salty and sweet taste of bacon, this is the book for you! Bacon*ish will show anyone how to prepare plant-based bacon that’s healthy and delicious too! Leinana Two Moons’ first cookbook provides hope for people who think that they could never live without animal bacon. 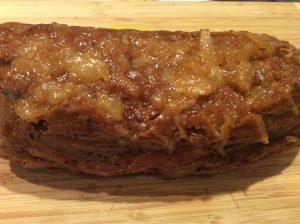 The author is curator of the blog Vegan Good Things and a skilled vegan cook. Like many vegans today, she wasn’t raised on a plant-based diet, but rather on the SAD diet (Standard American Diet). For most of us that diet included BLT’s, bacon cheeseburgers, glazed ham and a host of other foods which today have been definitively linked to heart disease and cancer as well as horrendous animal cruelty. 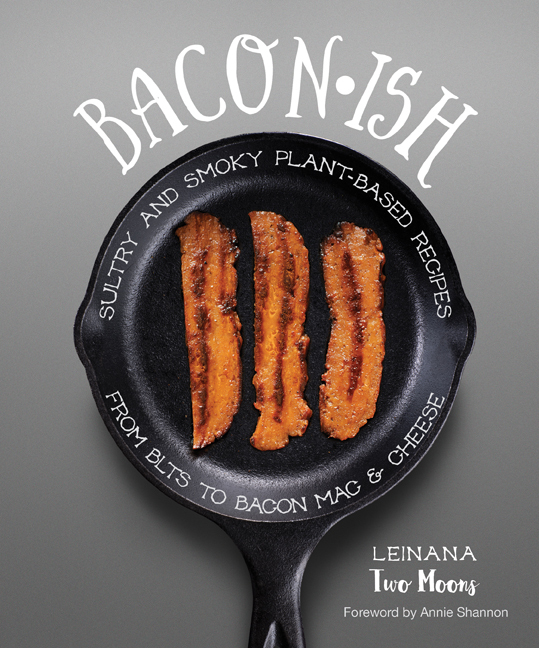 Leinana’s book teaches us how to create delicious and compassionate bacon using a host of healthy plant-based ingredients. The byline underneath the title of this cookbook states “Sultry and Smoky Plant-Based Recipes from BLT’s to Bacon Mac & Cheese”. The first chapter is an introduction to plant-based or vegan bacon. The second chapter is “Meet The Bacon’s” and is devoted to all kinds of plant-based bacon recipes including carrot, coconut, chickpea, eggplant, seitan, shiitake, tempeh and tofu in addition to recipes for “bacon*ish” foods like pineapple-glazed ham, bacon bits and chorizo. Subsequent chapters are divided into Breakfast, Soups, Salads, Sandwiches, Sides, Mains and Sweets & Such. In addition to a fantastic variety of mouthwatering recipes, the author provides a list of plant-based bacon products available commercially – whether vegan through design or accident. Recipes range from breakfast favorites like Bacon-Apple Fritter and Denver Omelet to decadent desserts like Coconut Panna Cotta, Nearly Instant Elvis Ice Cream and Sweet and Savory Bacon Jam. I prepared the Pineapple-Glazed Ham, Tempeh Bacon, Eggless McMuffins, Wedge Salad with Vegan Blue Cheese Dressing & Baconish Bits, White Bean and Bacon Soup and Coconut BLT. While some recipes were more involved than others, each dish offered a wonderful yet animal-friendly bacon flavor. 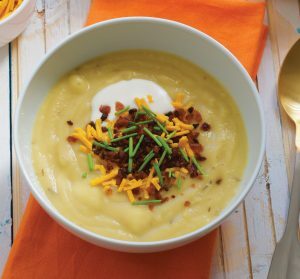 I can’t wait to try more recipes like the Loaded Potato Soup with Bacon, the BLT Hot Dogs with Bacon Remoulaude, the Butternut Squash Carbonara with Bacon & Sage and the Bacon-Topped Veggie Loaf. My favorites as of writing this review are the Coconut Bacon, Eggless McMuffin, Tempeh Bacon and Seitan Glazed Ham. Other tasters particularly enjoyed the Tempeh Bacon, Eggless McMuffins and Coconut Bacon. I hope you buy this cookbook. In fact, I hope every vegan and vegetarian buys two copies of this book, one to keep and one to give to someone who thinks they could never be vegan/veg because of bacon. Now they can. Below is Leinana’s recipe for Quiche Lorraine. Preheat the oven to 350 F. In a blender or food processor pulse the cashews until they are finely ground. Add the tofu, cornstarch, nutritional yeast, miso, mustard, and salt and onion powder. Blend until the mixture is very smooth. In a large bowl mix the tofu filling with the bacon and cheese. Pour the filling into the prepared pie crust and bake for 45 minutes, until deep golden brown on top. Cool on a wire rack for 20 minutes. Garnish with fresh chopped chives before serving. Pulse the flour, salt and butter in a food processor until crumbly. With the processor on, slowly pour in the cold water and let it run until the water forms a ball. Transfer the dough onto a floured sheet of parchment paper. With a well-floured rolling pin, roll the dough our flat until it will fit into a 9-inch pie pan. Use the parchment paper to lift up the dough and turn it over into the pie pan, then peel the paper away. Trim any excess dough from around the edges of the pie pan. The crust is now ready to fill and bake.